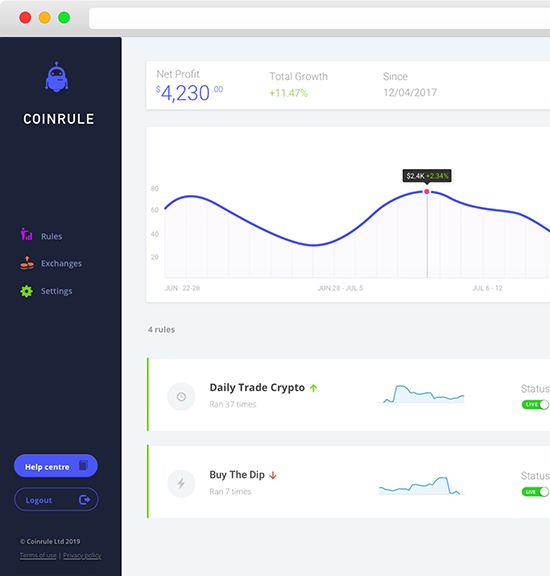 Coinrule develops the most convenient and most user-friendly cryptocurrency app. With Coinrule you can create your own rule based on XMR and let it run automatically on varied crypto exchanges like Binance. It is the If-This-Then-That for automatic strategies that allows you to manage to all opportunities on the market. Coinrule meets the demands of diverse types of investors and traders. Easily review and run your automated trading in minutes on Binance. Simply manage your coins , protect your portfolio and top the market without dropping a single opportunity. Even in moments of low market volatility, some altcoins can still have a level of volatility that can provide great opportunities. Buy the coins dropping and sell those jumping, you can seize these market movements by running your orders using a crypto bot. rules your crypto capital has never been so agile! Ever wondered how to automatize your trading plan but you don't have coding expertise? Coinrule is based on a If-This-Then-That approach, we suggest a user-friendly solution and many guides that will enable you designing your first strategy on Binance. Receive free trading signals, createstrategies and manage your coins for 30 days for free.